As a reviewer, I get sent so much stuff to review that I rarely write reviews for albums that I've actually bought - it takes an album to be really special to get me to do that, and this is one such album. Chantal Claret is the former singer of Morningwood and is married to Jimmy Urine, the singer of Mindless Self Indulgence. Her last album, "The one, the only..." had a real upbeat 60s pop influence to it but mixed with other sounds to give it a fresh feel and was a great album. 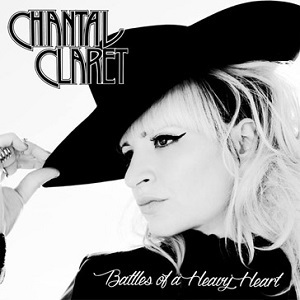 Since then she's released the "No good way to die" EP which had a limited release and is now back with another full-length album - "Battles of a heavy heart". Like the EP, the album was funded via a Pledge campaign which reached it's target extremely quickly - a sign of the level of support she has from fans. Nothing about this album is big corporate or mass produced - the music isn't the usual stuff that fits in neat pigeonholes that the labels like to churn out, and everything here has the personal touch - the CD I got wasnt a mass-produced one, but was clearly done at home. It still looks good but has that personal touch that makes it a little bit more special. Chantal Claret is a perfect example of how the internet has enabled artists to communicate directly with fans and bypass the traditional music industry, and it's great that fans are supporting her, and even better is the fact that the money from album sales goes direct to her rather than if you buy the latest chart CD where most of the money you spend ends up with the retailers, wholesalers and recod label with only a tiny amount going to the artist. Four of the tracks on the album were on the "No good way to die" EP, but since only a handful of physical CDs were made of that, for most people this album is their first chance to get the songs on CD or vinyl. Brief comments on a few tracks. Next is "No good way to die", a song that has a very catchy Rock and roll guitar part but also has some of the 60s pop feel of the previous album. It's a great song and is my favourite from the album. "Untamed hearts" is a song that has been released as a lyric video - check it out below. As with everything else it's not a high budget video - it looks to have been recorded on a camera-phone. In fact the only area that feels like money hasn't been a problem is the music itself - there's certainly been no cutting of corners in making this album. "Hold up" has more of a hard rock guitar sound which comes as a bit of a shock after the soft vocal opening, but it's yet another great song. "Davy Crockett" has a nice nod towards the Ramones with the "gabba gabba hey" line. It's one of many interesting little details you notice as you listen to the album. Every song here has it's own distinct sound yet all fit well together and the overall album is fantastic - I've probably listened to over a hundred albums this year already but this definitely rates in the top ten. The songs are all farily short - typically around 3 minutes long, which means they don't have time to overstay their welcome and there are no indulgent guitar solos or anything else to pad them out - the songs are short and packa punch. It's such a great record and has a distinctive sound that sets it apart from everyone else. This album is highly recommended.